Dusted with Old Bay Seasoning. Served warm or cold. All of our steaks are USDA choice or a higher and aged a minimum of 28 days. All steaks are seasoned with kosher salt, black pepper and brushed with our herb butter. Served with Harborside salad and your choice of one fresh side. All of our fish is hand cut to 8 - 9 oz. portions and seasoned with our house blend of spices. All grilled fish are brushed with our herb butter. 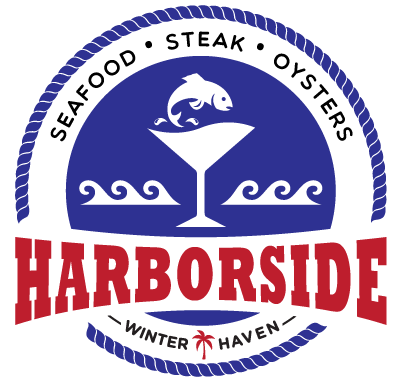 Served with Harborside salad and your choice of one fresh side. Enjoy your fish grilled with our herb butter or choose from another preparation. Grilled with island teriyaki sauce, blackened, or broiled with herb butter. Served with Harborside salad and your choice of one fresh side. Herb grilled chicken breast topped with smoked bacon, Swiss cheese, lettuce, tomato and red onion. Served on a toasted brioche bun. Grilled chicken breast topped with our crabcake blend and hollandaise sauce. Large hand breaded shrimp served with homemade cocktail sauce. Large shrimp pan sautéed with garlic, lemon, butter and white wine. Topped with shaved parmesan cheese and served over fettuccine pasta. Beer battered Haddock. Served with house fries and Florida key lime-dill tar tar sauce. 1/2 Lb / 1 Lb. 1 LB. / 1 1/2 LB.